Houses & Homes VA: Is it possible to actually sell electricity back to the electric company? Is it possible to actually sell electricity back to the electric company? We’ve all heard the stories about homeowners that generate their own electricity and sell the “surplus” back to the local utility company, but is this really true? Actually, the federal government requires a total of 42 states (as well as the District of Columbia) to purchase surplus power from consumers but the amount that many of the utilities pay may be much less than you think. If you’re like me you probably assumed that you would receive the same amount per kilowatt as you would pay but this is not the case. Although the amount varies from state to state, basically the utility companies will pay you for what your cost is to generate the excess electricity and not what they charge their customers. As an example, if your local utility charges $.10 per kilowatt hour but it costs you only $.02 per kilowatt to produce your own power, than that is what you would receive from the power company. The “payout” is normally done on a yearly basis and not monthly as you might have assumed. For each month that you produce more electricity than you use from the electric company you will receive a monthly statement with a credit applied to it. At the end of a 1 year period if you have produced more power than you have used for the previous 12 month period than you will receive a check for the difference. Yes, it is possible to actually make a small amount of money in this way but I doubt that you will be able to retire in Hawaii! You will also need your power meter to contain what is known as an “inverter”. This allows the electric company to measure how much power you are actually generating. I am told that most modern meters already have this device built in but I am no expert in this matter. Some states actually require you to obtain a permit to do this and other stipulations could apply as well (such as obtaining a certain type of homeowner’s insurance). As you already know, most people that endeavor to produce their own electricity invest in solar panels and equipment to get the job done. If you haven’t checked the prices lately you will discover that it takes quite a large investment to produce enough energy for the average home and may take many years to recover the initial investment. That’s not to say that it can’t be done but the initial capital required is often more than most homeowners are willing to invest. 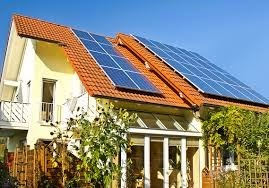 Most people that use solar power produce enough to “supplement” the amount that they use from the electric company but not enough to have a surplus. If this is something that you are interested in trying or if you would like more detailed information you might want to visit the website for the Database of State Incentives for Renewables & Efficiency at www.dsireusa.org. This website keeps abreast of all of the laws governing the selling of energy for all 50 states. Even if you aren’t interested in becoming your own electric company, you might be able to shave a few dollars off your monthly utility bill with a modest investment.